This model is replaced with updated model HY3010EX. 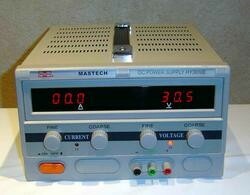 Mastech Power Supply HY3010E is high quality variable regulated switching DC power supply. The switch mode power supply (SMPS) has two levels of control over both current and voltage outputs (coarse and fine), which can be continuously adjustable at 0-30V DC and 0-10A. The unit comes with 2 LED displays, providing accurate and clearly visible readout for the voltage and current value. Retails well over $300.